I’m keeping all my Ferrari, Frazer Nash, and McLaren F1 road car images. The Ferrari images are now on www.ferraribyneillbruce.co.uk where there are pdf catalogues to download. All images are scanned into digital and ready for licenced usage. I also have a small number of Jaguar images. 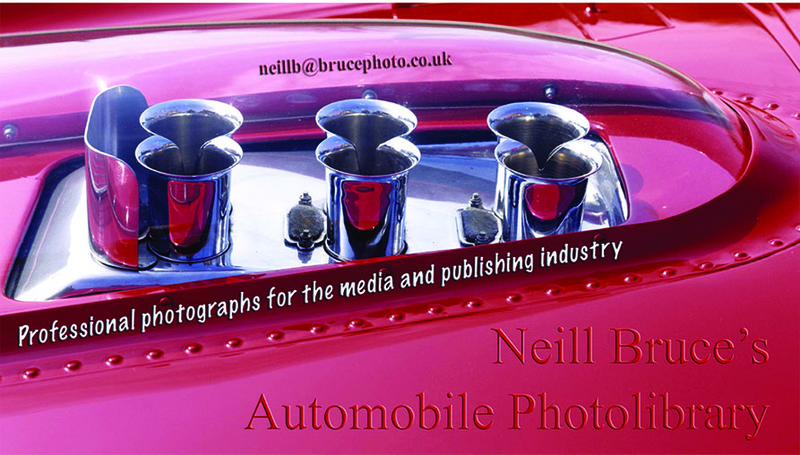 Contact <neillb@brucephoto.co.uk> for details of all the above images still available to use. Most of the material has gone to R.Lintelmann in Germany. Daniel Briston has: Austin, Chevrolet (corvette & camaro), De Dion, Fiat, Ford RS, Lancia, Land / Range Rover, MG, Mitsubishi, Morris, Peugeot, Porsche, Salmson, Singer, Subaru, Toyota, Trojan and some misc such as childrens pedal cars, military vehicles and fire engines! Jaguar Heritage have most of my jaguar material (i still retain a small amount). All Lamborghini went to Matthias Pfannmueller, Switzerland.